About this post: Where to go in Taiwan? In this offbeat Taiwan travel guide, I explore Taiwan places to visit, cherry blossom in Taiwan, cycling Taroko gorge, vegan Taiwan, vegetarian food in Taiwan and offbeat things to do in Taiwan. My Taiwan travel tips include lesser known points of interest in Taiwan as well as where to go in Taiwan if you want to get off the tourist trail. The mist rolled in as we drove on the winding road, engulfing the tea plantations, the cherry blossoms, the road, the mountains and even the darkness, casting a magical kind of aura that my Taiwanese host – a tea farmer – maneuvered expertly despite zero visibility. But we weren’t driving to the bamboo groves in the middle of the night for the mist. On that dark, foggy night, we were looking for fireflies that come to Fengchihu in spring, and light up the forests like blinking Christmas lights. To tell you the truth, I knew nothing about Taiwan except stinky tofu – a dish I once had a smelly encounter with in Singapore – that has acquired something of a national status. I decided to join a friend to travel there simply because I found a cheap flight and could get visa on arrival with my US visa. Even as we landed in Taipei, a city with industrial buildings, dense forests and a charming cafe culture, I had no idea that we were going to cycle down a dramatic gorge, share a meal with an aboriginal family (short of monkey brains!) and get lucky enough to see the season’s first cherry blossoms. First glimpse of Taiwan’s countryside in Taroko… and a stuck camera shutter! Cycling up the dramatic Taroko Gorge! I was a little intimidated as we piled into a car with mountain bikes and drove halfway up the dramatic Taroko Gorge, but adrenalin took over the moment I got on the bike. We trudged up along the incredible cliff-side scenery, then whizzed downhill through dimly lit winding tunnels, under precariously cut mountains hanging over the road (reminding me of the high Himalayan roads), past dense forests with centuries old Buddhist temples, down to the Liwu river gushing with the intensity of my adrenalin. Plenty of tour buses do ‘sightseeing day trips’ along the Taroko Gorge, but experiencing its wild side on two wheels was pure exhilaration. Most accommodations near Taroko Gorge offer mountain bikes (check before booking). The initial part of the ride is steep and not too exciting, so it’s a good idea to start early, get dropped midway and make stops while cycling along the well-marked trail. The stops I loved most were the unnamed, unpopular ones, with old hanging bridges across the gorge leading to old Buddhist temples or dense forests. Take a train from Taipei to Taroko Gorge. When my hostess Uma insisted I try their traditional clothes! History suggests that when China became a communist nation back in 1949, many people fled to nearby Taiwan, then a small island with a small indigenous population of Trukus scattered on the eastern side. So even though the majority of Taiwan is culturally representative of mainland China, the descendants of the Trukus keep much of their aboroginal culture, cuisine and way of life alive – and we were lucky enough to experience it first hand, in an Airbnb that was built entirely by hand by our host Truku family! In their living room, we found the head of a goat, the blood still fresh from the hunt, learnt to smash bamboo sticks on a stone to get the sticky rice out for dinner, and saw a glimpse of the forests where their grandparents once lived. In my traditional Truku (vegan) dinner, I tasted purple yam quoted with rice flour, cabbage and bean curd rolls, some sort of leaf fried in rice flour (and cut into the shape of a fish! ), sautéed crispy tofu, baby corn steamed with the leaves, a soup made with wild leaves and plants (literally, it had nothing else, not even salt or pepper). The other guests, who didn’t opt for vegan/vegetarian, could hardly palate their wild boar meat and gooey mambo fish… and midway through the meal, our Truku host showed up with his rifle. “Monkey very good”, he said… “to eat”. Luckily he hadn’t been able to shoot one in time for dinner! We stayed with a Truku family through Airbnb (managed by their daughter who speaks a bit of English), and communicated mostly through sign language and Google translate. Their home is located in a picturesque little village called Xiulin, not far from Taroko Gorge, and a short drive from Xincheng train station. I could have easily spent a week exploring this mountain neighborhood, but a short trip combined with cycling Taroko Gorge was fun too. Sign up on Airbnb with my referral to get 15$ off your first stay. A traditional (vegan) dinner with my Truku hosts. I was surprised to learn that a considerable part of the Taiwanese population eat only Buddhist vegatarian food – no meat, no seafood, no eggs, no onions or garlic (similar to Jain food in India). And considering dairy doesn’t feature much in the cuisine anyway, Buddhist vegetarian is also vegan and easily available. However, I have to confess I had mixed food experiences in Taiwan. I loved the spicy, herb-infused, Sichuan influenced flavors on the eastern part of the island, dominated by the aboriginal people. Even at small roadside shacks, I feasted on local food like sesame paste noodles and stir fry made with tofu, mushroom or other veggies. But in the western part of the country, I struggled, not because I couldn’t find anything vegan but because the food felt somewhat flavorless. Many times, I had to force myself to eat bland boiled or steamed leaves, and on one unlucky occasion, I ate some sort of fermented tofu (not as fermented as stinky tofu) that my body had a hellish time trying to digest. Taipei, though, turned out to be a vegan paradise! We spent most of our two days in the city eating, and I even ran into friends who flew in from Hong Kong over the weekend just to eat. Steamed veggie dumplings at the original Din Tai Fung shophouse, Sichuan style leeks and tofu at the late night Fifi Tea House, cheesy vegan pizzas at Tofunia, power smoothies and fusion burritos atAbout Animals… I’m salivating even as I type this. I was sad to miss out on this vegan-friendly stay and night market sojourn in Taipei… next time! Feel the magic of a million fireflies! Fireflies shimmer in the dark in Fenchihu. To stand there, in the bamboo groves of Fengchihu, on a dark, foggy night, and watch thousands of fireflies twinkle and send lightwaves… there are some feelings no photos or words can capture, you just have to travel for them. I was surprised to learn that adult fireflies, the ones with the glowing light, live only for 10-15 days… but it takes them almost a year to grow from egg to larva to pupa to an adult. Their biggest enemy? Manmade lights. Because the male finds and attracts the female to reproduce by sending lightwaves. We did a night walk with our hosts at TianYi homestay in Fenchihu. I appreciated their responsible approach to observing the fireflies – we were given dim lanterns, and asked to keep silent and avoid flash photography / LED lights on electronic devices. Take a train to Chiayi station, then a bus to Fenchihu. Mesmerized by my first cherry blossoms! Most people flock to Japan for the cherry blossom season, but we got lucky in Taiwan. The cherry trees bloom only for 2 weeks in a year, and with the weather patterns all haywire, we had no idea of the status even when we impulsively got on the train and bus to Fenchihu. We spent our days walking around old cypress forests and abandoned railway lines in Alishan, surrounded by cherry blossoms in shades of white, pink and magenta. In retrospect though, the selfie-snapping crowds definitely took away from the experience. Next time, I would plan better and try to get to a further away mountain for a real wilderness feeling. Cycling the East Rift Valley. After cycling the Taroko Gorge, we couldn’t wait to get on bicycles again, and Taiwan’s East Rift Valley – with the dramatic Eastern Coastal Mountain Range on one side and the roaring Pacific Ocean on the other – is perfect for a mix of cycling trails, cafes tucked away into the mountains, black sand beaches and lush rice paddies. We chose to spend lazy, do nothing days in our artsy apartment, but you can also choose to cycle one of the longer trails. I loved our independent house in a little village off Dulan, an Airbnb designed by a young Taiwanese artist using light and color in a unique and soothing way. It was an easy walk into town for food, and down to the Pacific coast. Take a train to Dulan, then a bus to Donghe. A rare sea of clouds in Fenchihu. In search of cherry blossoms, we impulsively booked TianYi homestay in Fenchihu – and it turned out to be an experience in itself. Surrounded by mist-clad tea plantations, this was the home of a small-scale tea farmer, where we spent our days sampling local oolong teas in elaborate tea ceremonies, sleeping in a wooden cabin, and hearing stories (from their son, who spoke good English) of life in these mountains. 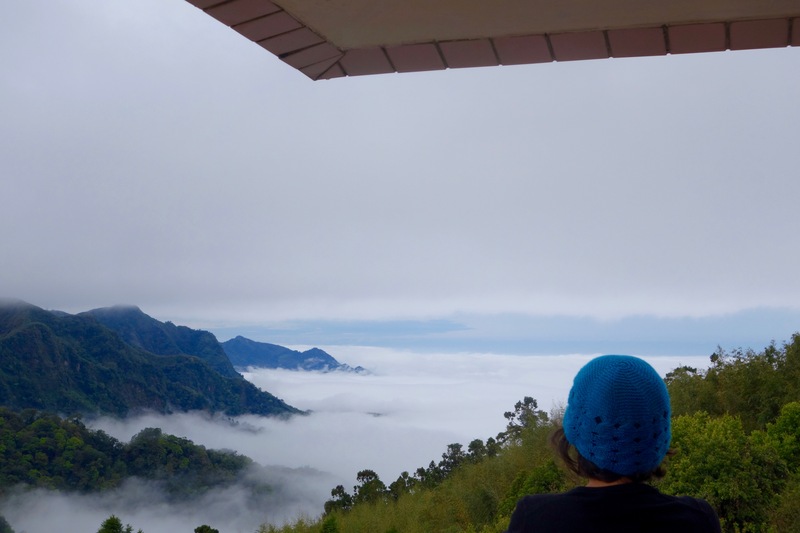 Then one morning, we woke up to a rare sea of clouds engulfing the valley below; I’ve never seen anything like it. Since we booked TianYi homestay last minute, we took the bus all the way to Fenchihu town, only to hitch a ride back towards the main road. The nearest bus stop is at Seven Eleven; ask the hosts to pick you up from there. Traveling by train in Taiwan – scenic and eco-friendly! Taiwan has a great train system – comfortable even for long distances, affordable and scenic. We travelled in April and comfortably got train and bus tickets on the spot, including the High Speed Rail. Taipei Airport to Taipei City: The Airport MRT started in Taipei only in March 2017 and many hotels / B&Bs are still unaware of it. There is a dedicated terminal at Taipei Main Station, where express check-in for some flights is also possible. The trains run frequently, take about 40 minutes to the airport, are much more efficient than the airport bus to the city, and much cheaper than taxis. Bullet trains (High Speed Rail): Taiwan’s High Speed Rail mostly runs from Taipei towards the western part of the country, and is an experience in itself, covering distances in almost half the time of normal trains. Regular train stations don’t sell High Speed Rail tickets (and even seemed to discourage us from buying them); HSR stations are located separately, but there’s usually a shuttle bus connecting the two. Rice rolls stuffed with veggies, and wild herbal tea – breakfast at my Truku homestay. Taipei has plenty of choices for vegan/vegetarian food and staff at nearly all restaurants/cafes speak some English. But on the countryside, it is really important to be able to communicate what you eat and what you don’t. Google translate rules! Mandarin is a tricky language, and I was only able to get my pronunciation right on the last couple of days… however, showing a translated message on my phone always worked. Since dairy is not a big part of Taiwanese cuisine, most vegetarian food is also vegan. Imagine my joy when I heard that the entire island nation of Taiwan is connected by public wifi! Indeed, you can register for a free tourist wifi at the information counter at the airport (when you step out after collecting your bags), and use it at all railway and MRT stations. Most accommodations and eateries offer free wifi as well. Reflections on a rainy day in Taipei. We were lucky to have mostly cloudy, partly rainy weather in Taiwan in April, which made for cool days and chilly nights, especially in the mountains – layers work best in such weather. Clear days tend to have very strong sun, so carry sun protection, including sun hats, sunscreen and shades. Have you been to Taiwan? What were your favorite travel experiences? Join me on Facebook, Twitter and Instagram for more alternate travel ideas. Hi Shivya, thanks to your blog about Taroko, we are staying with Uma and Tai at their bnb. They say Hi to you! 🙂 …. We have had such a great time here Thanks! Thank chou for sharing this beautiful journey with me. I wish one day I shall also travel like this My best wishes to you. I loved to read your soul touching experience of the trip. My son who had stayed there for his studies for about an year failed to quench my curiosity about the aborigines, their culture ,weather changes , which you so beautifully touched. Great to read. Beautiful photos. Taiwan has been on my list for such a long time. I would certainly takes tips from this post, esp the food part. Excellent! Currently in South East Asia and has become curious to travel Taiwan as well. This article has made me more curious to visit Taiwan. Moreover, there is visa on arrival for Indians with a US visa. Perfect. I really appreciate your perspective and blog in general! I’ve done a good bit of travelling and living abroad for my 19 years of life, and I’ve never found a blog that is so honest and gets whats important about travel – short or long term. Your blog- indeed a very interesting write-up capturing the fine details of unexplored areas of Taiwan! I have been to Taiwan once and your article brought back good memories of food, fireflies, tea, beautiful scenery and friendly people. I’d like to go back and try some of the experiences you describe. Taiwan is really good! I have travelled once in Taiwan! It’s really good that you pointed out small Points in this really informative article! It will help a lot! And yes! Trains there is really good! Hi Shivya ! I love your blog (like so many others) and nominate you for the Blogger Recognition Award! I had NO idea Taiwan had so much of vegan food! This gives me another reason to put this place on my bucket list. lovely post. Hello, Ma’am. I’ve seen almost all your blogs. And I love the way you put words and describe a place so beautifully. The post is amazing and I now want to go to Taiwan so desperately. I myself started a new blog. I’m a fresher in the field. Keep uploading great stuff. Thank you! Love this! We’ve been in Taiwan for a year and haven’t heard of some of these places, thanks! Previous PostBombay to Barcelona: How Travelling Inspired an Indian Street Kid to Chase an Impossible Dream. Next PostAdvice for the Young and Penniless Who Want to Travel.